Aquatic Therapy Helps ALL Ages! Copied from the Winchester Sun. It has been our pleasure to work with DJ, Joan, and Steve. This is truly an amazing family and and even more AMAZING young man! 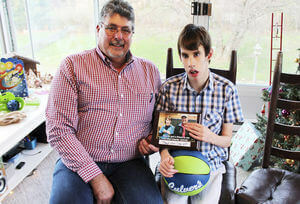 For most of DJ’s life, doctors were unable to provide a definitive diagnosis, until at 11 years old, DJ was diagnosed with genetic mitochondrial disease, which stems from a carnitine deficiency that was not diagnosed at birth. Depending on which cells of the body are affected, symptoms of mitochondrial disease manifest in different ways. In DJ’s case, his central nervous system, kidneys and digestive system are impaired by the disease. His most significant impairments are caused by scarring on the part of his brain that controls speech, so he communicates through body and sign language, sounds his family and friends understand and more recently through the use of an iPad app. He also has weak muscles, causing him to walk with bent legs and subluxation of his hips. He works regularly with a variety of therapists in order to overcome hurdles he faces because of the disease. He works with Cheri Rogers, an occupational therapist for Lifespan Therapy, and Danielle Eckman, speech and language pathologist with Core 4 Therapy Group, on a weekly basis. The two collaborate to make the most out of DJ’s therapy time. He also sees a physical therapist at Advantage Physical Therapy in Lexington. Because the signal between DJ’s brain and his muscles is interrupted, he is unable to chew solid food, making it difficult for the family to eat out. Joan said DJ is also easily “wired up” and has sensitive hearing, so crowded and loud places can become too much for him to handle. “He’ll begin pulling his hair or biting his hands,” she said. The couple have four other sons — Jacob, Nathan, Dalton and Colton— and for these reasons the Graves family typically can’t eat out often. On a recent trip home from a physical therapy appointment, they were looking for a place to eat. Knowing DJ was a bit on edge that day, the couple decided to visit a Culver’s drive-thru. After DJ’s next therapy appointment, the family decided to visit Culver’s again. This time, Joan took to social media to express her excitement over finding a suitable menu option for her son. She tweeted a photo of DJ with a Culver’s wrapper and tagged the casual dining restaurant. Soon, the photo was being shared and favorited like crazy, Joan said. “About a week later, I got a tweet back from Culver’s asking for our name and contact information,” Joan said. The family was told a Central Kentucky Culver’s franchisee was interested in throwing a party in DJ’s honor. Charlie and Wendy Jordan own the Reynolds Road Culver’s franchise in Lexington and the Georgetown location. In honor of DJ’s 16th birthday, the couple threw him a party at their Georgetown operation complete with Culver’s gifts and a meal for the family. Subsequent Facebook posts about DJ’s special day have garnered more than 600 shares and have been seen by more than 35,000 users, many of whom have reached out to the family to share their own stories of hope and inspiration. The Graveses manage P3, a Facebook group dedicated parents of special needs children. It’s a place where parents can share their own struggles and successes with their children. Through the page, Joan discovered how powerful sharing her family’s stories could be. Steve said its not only the parents of other special needs kids that needed to hear DJ’s story.